I'm trying to use the Emerald Battle Engine Upgrade with my Emerald ROM. I'm not able to view my expanded Pokemon in PGE because I am getting "Unable to read beyond the end of the stream" sometimes and "RecordNumber is not valid" sometimes. I installed this third, with the PokeExpansion first and the ItemTmTutorExpansion second. Sorry, can't help you with the. The guys that made that aren't even working on it anymore. Hey! "Import all sprite sheets" button is not working. It loads all the sprite(the green bar thing I mean). But when I select a pokemon, I can't see their changed sprites. All pokemon sprite sheets are in this order in the folder. 3.png..and it goes on to 1012. I don't know if this is the right place to ask, But can I ask someone to hack in a few pokemon for me to go onto USUM? If this isn't the place to ask, do you know where I can go? Hacking Helpdesk, I guess. You're better off going to some other forum more specialized in that kind of thing though. The way you worded it makes me think you're looking for someone to inject some pokémon in your savefile, which isn't really hacking but injecting. Not sure what to tell you, it seems to be working fine. I tried again...Now the its not even responding. I tired again...Now the its not even responding. Wait for it to finish. Inserting hundreds of sprites is not instant and may take a longer on slower machines. Well, it just loaded all the sprites...Still confused why it didn't work earlier. Anyway, thanks for your support. It expanded to 1488, although I tried to expand it to 1460. It added 28 slots for some reason. Those slots might have something to do with the Unown forms as well as the Bad Egg. I've noticed that PGE adds a lot more slots than I tell it to as well, ie after Chimecho is an "EGG", then the Unown forms, then the number of slots I requested. Slots have to be there but are not used. 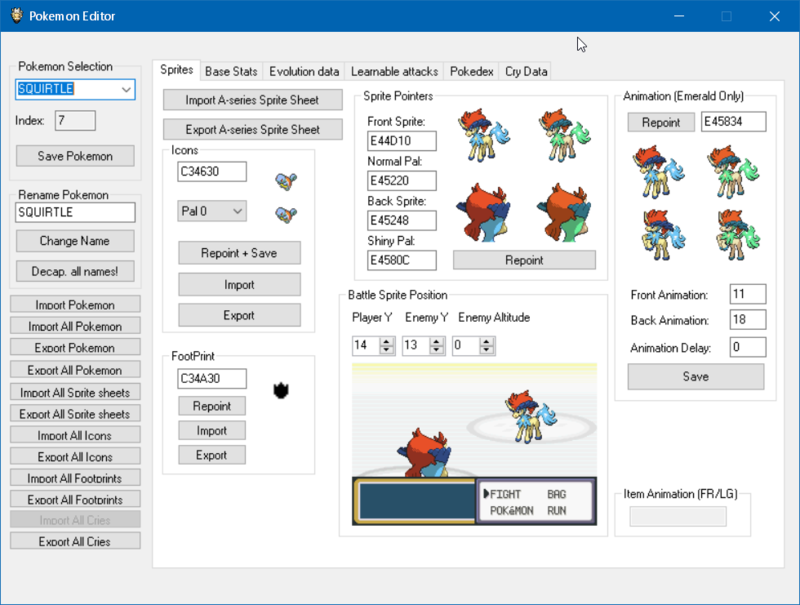 As of late, I have been attempting to use the Pokemon Game Editor in conjunction with the Mr. Doll Steak rom base. I am aware that you have already posted some information regarding needing to change and update the roms.ini, yet I am still struggling with errors. I have the correct fire red rom and I have patched it with both the main ips and the 1.5 ips update, using the Lunar update patcher. I also have downloaded the updated roms.ini which you posted for making PGE 3.4 compatible with Mr. Doll Steaks base, and replaced the ini which came in the download with this new roms.ini, which is located in the ini file in the PGE. I have not altered the ini which came in the Mr. Doll Steak download, but I don't think that should be a problem. Despite this, I still encounter the error below. I am new to using PGE and roms.ini files, so it is probably a stupid mistake, but I cannot find a solution online and am stumped. Any help would be greatly appreciated. (I didn't want to post too much extraneous information of what I have attempted, but if you need more information to assist, please inform me) Thanks! You can visit this thread to get a .ini file for MrDS Patch compatible with PGE's latest version. Hi so I am attempting to add more items to the game. I have repointed the item data to ensure there is enough free space for the new items, and repointed any pointers to item tables as well as IMGData for images and palettes pertaining to items. Is this a common issue when adding more items? My personal guess is that I missed a pointer to the item table, but I went back into the Hex Editor and I dont appear to have missed anything. I also change the amount of total items via Hex Editing. Unfortunately I can not help you with this as it does not seem to be a PGE issue. Please ask elsewhere. Good luck! So I assume it is normally possible to edit beyond the 375 default items normally? Hello. Not specifically PGE related but was wondering if you had any advice, 'm stugling to find it elsewhere. I have updated the PGE .ini to allow for 8 evolutions ber Pokemon, namely for Eevee, however I am uncertain how to tell the rom that there are now 8 evolutions per Pokemon so evolutions aren't currently working properly. Do you know what I need to do to fix this? Unfortunately I can not help you with this. This thread is for issues with PGE and the feature you are asking about is not installed by PGE. PGE doesn't work, but G3T works perfectly. What could the problem be?